The interpretations in A Heart Afire are as rich and meaningful as the teachings and tales themselves in this intimate guided tour of Hasidism and Hasidic storytelling led by Reb Zalman, an old-world Hasidic elder who is also profoundly connected to modern culture. As a bridge between both worlds, Reb Zalman, and his co-author and student Netanel Miles-Yepez, introduce the reader to rare and unique translations of Hasidism with their own personal reflections on their meaning. This book gives the readers the opportunity to immerse themselves in the world of Hasidic wisdom and narrative and in the teachings of a modern Hasidic master. Zalman Schachter-Shalomi, known as Reb Zalman, is the father of the neo-Hasidic Jewish Renewal movement. He was ordained by HaBaD-Lubavitch in1947, and later received his MA from Boston University and DHL from Hebrew Union College. He is professor emeritus of Psychology of Religion and Jewish Mysticism at Temple University and is World Wisdom Chair holder emeritus at Naropa University. He is the author of Spiritual Intimacy and collaborated with Miles-Yepez on Wrapped in a Holy Flame: Tales and Teachings of the Hasidic Masters. Netanel Miles-Yepez is a teacher of Sufism and Hasidism and, with Rabbi Zalman Schachter-Shalomi, is the co-founder of the Sufi-Hasidic, Inayati-Maimuni Tariqat, the only Jewish order of Sufis in the world. He collaborated with Reb Zalman on Wrapped in a Holy Flame: Teachings and Tales of the Hasidic Masters and is the editor of The Common Heart: An Experience of Interreligious Dialogue. He is also the executive director of the Reb Zalman Legacy Project. "Rabbi Zalman Schachter-Shalomi (Reb Zalman) has, almost single-handedly, brought living, formative, Hasidic spirituality to three generations of liberal Jews. Indeed, his astonishingly fecund ideas and stories have profoundly altered the landscape of American Judaism. In A Heart Afire, Zalman now shares with us the mother lode of his teaching and example. We are all ever in his debt. "—Rabbi Lawrence Kushner, Emanu-El Scholar at Congregation Emanu-El of San Francisco. He is the author of Kabbalah: A Love Story and numerous books on Jewish spirituality. "This book is a brilliant anthology of early hasidic teaching, but it is much, much more. The teachings are embedded in Reb Zalman's profoundly felt, life-long practice of Jewish renewal, and his universalistic outlook that encompasses teachings from Sufism, Buddhism and depth psychology . . . This is a book to read and reread, absorb and cherish. "—Rodger Kamenetz, author of The History of Last Night's Dream and The Jew in the Lotus. 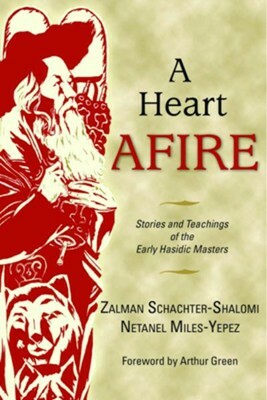 "A Heart Afire is a tour-de-force that will take its place beside the efforts of Buber and Wiesel to bring the deep spiritual practices, stories and perspective of Hassidic tradition to life and to be of service to contemporary readers of all persuasions. A must for homes and universities, this combination of historical perspective, clear, readable and inspiring translations brings a broader range of Hassidic masters to the reader's attention than has ever before been available. "—Rabbi Goldie Milgram, author of Meaning & Mitzvah: Daily Practices for Reclaiming Judaism through Prayer, God, Torah, Hebrew, Mitzvot & Peoplehood; Reclaiming Judaism as a Spiritual Practice: Holy Days and Shabbat; among other recent books. I'm the author/artist and I want to review Heart Afire: Stories and Teachings of the Early Hasidic Masters.